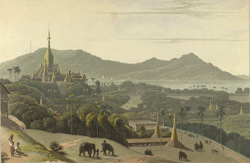 This aquatint was made from plate 8 of 'Views in the Burman Empire' by Captain James Kershaw. This is another view of a road illustrated in plate 6, near Shwesandaw Paya, the sacred Buddhist monument of Prome (Pye). Kershaw wrote: "The road seen here ... generally presented an animated and interesting scene, being constantly enlivened by the peasantry, who, laden with fruit or provisions for sale, now came familiarly and gladly among the army, whose prompt payment and general kindness soon won their confidence. From this point were seen to great advantage their religious processions to the Shoe Shando Prah."